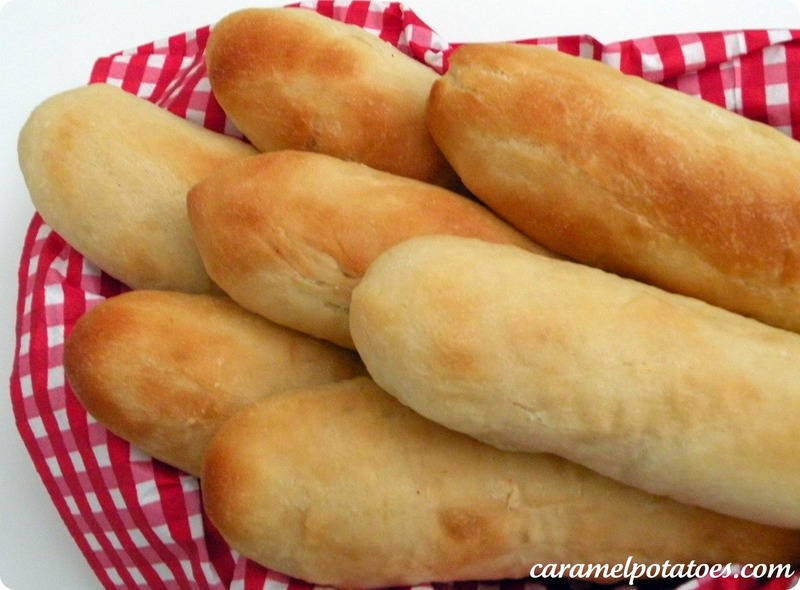 I really enjoy fresh-baked bread-right from the oven warm, and so soft. Mmmm….It really is a weakness for me. I can guarantee that I will eat way too much of it. Luckily though, I am not alone in this. It is my entire family. Everyone eats too much of it. But it is so good. And I love that when I have baked it I know exactly what is in it. There are no preservatives or extra additions that may or may not be good for your body. In a large mixing bowl, dissolve yeast and 1 tablespoon sugar in 1 cup warm water. (Let it sit about 5 minutes and get good and foamy. This is how you know your yeast is active.) Add the oil, egg, salt, remaining sugar, water and 2 cups of flour. Knead dough until smooth and elastic about 6-8 minutes. (I knead in the mixer with the dough hook attachment. Of course, you could also turn the dough out onto a floured surface and knead by hand.) Place in a greased bowl, turning once to grease top. Cover and let rise in warm place until doubled, about 40-60 minutes. The time it takes to rise will vary based to the temperature of your kitchen. Punch the dough down. Turn onto a floured surface; divide into 36 pieces. Shape each piece into a 6 inch rope. Place 2 inches apart on greased baking sheets. Cover and let rise until doubled, about 25 minutes. I brush a little of melted butter on the tops of each breadstick and then sprinkle just a little garlic salt across the top just before baking (Parmesan cheese is good also). Bake at 400 for 10-12 minutes or until golden brown. I highly recommend you eat these with Chicken Spaghetti, Ravioli with Toasted Walnuts and Sprinach, or Pasta Carbonara – YUM! Today is the last day to enter our Cinemark Movie Pass Giveaway!!! Winner will be announced tomorrow-Good Luck! !